"Great platform that I have waited years to find"
Sign in to G2 to see what your connections have to say about BAM! "Great asset management tool that is only going to get better." If you're responsible for managing an avalanche of digital data and also have a group of users whose tech savvy ranges from swiftly duplicating files to their local desktop all the way to "But can't I just print everything out and have it that way? Also, I deleted half of that document because I only needed some of those pages and then I accidentally hit save, is that okay? ", DAM may be the answer to your woes. In addition to the structured file management and hosting system is a fantastic mobile sales tool that will allow your sales team to quickly access the data you've deemed most relevant for their needs. When you have folders upon sub-folders of photos, spreadsheets, presentations, PDFs, and videos (drafts, edited drafts, final, new! final), most often individual users will get frustrated as their personal organization systems don't mesh with what you as an administrator have created. DAM allows you to have your bank of assets within a folder system that is separate to what you "deploy" to the mobile sales team front, allowing for your admin self to indulge in your cookie dough ice cream while your lactose-intolerant users stay in their vegan ice cream lane. This might seem like a minor boon of convenience at first glance, but in reality it's an incredible time-saver. Typically when I've had to change a file within a folder system, it was necessary for me to notify all users in an emailed announcement ("Please note that the file in Folder A > Sub-folder 3 > Sub-sub folder 2 > File 281.jpg has been updated."). Then, I would need to individually chase down our employees that work in other territories and time zones to let them know that the email I just sent out is in fact relevant to them. When multiple files have been changed, it's even more tedious. With the mobile sales tool, I can unpublish, update, and re-publish instantly and those changes are immediately reflected at the user level. As a digital administrator, I cannot properly encapsulate how being able to simply send a "Refresh your mobile app for changes." notification to our sales team makes me feel beyond a *chef kiss* gesture. Truly, I love what DAM has to offer, and if you get in touch with the team at BAM! and hear about all the amazing updates they're bringing on in the next month or two, you'll hit the request a demo button right now. Nothing, just waiting for the new features that should roll out next month! I recommend contacting BAM! about their new features they intend to implement this year. Right now its focus is on Digital Asset Management and mobile deployment, but they have so much more coming, and it's the new features that have me so excited. "Not your ordinary asset management"
The interface is really intuitive, and the BAM! team was fantastic to work with every time I had a question. It's like they designed it with my needs in mind--every time I wondered to myself, "Hmm, what if I could..." then BAM! The functionality was there. It really is the complete package. I know this will make my everyday business operations easier, but I can see how it would be beneficial in a wide variety of other industries, too. I can't wait to be able to use some of the features the company is already at work on adding. It'll be great to get my hands on those! Definitely worth your time to check it out. And the company has been super receptive to my feedback and requests, so be sure to talk to them if it's missing something you need. The age-old problems of outdated versions of sales sheets, customized pricing getting handed to the wrong client, and trying to describe what you just wish you had a picture of are gone. This product makes me and my entire team look good. "The solution we've been waiting for"
The BAM! team was amazing to work with. Very responsive and helpful. They listened to our needs and built a great product that continues to get better. When you do a BETA launch and 99% of your initial feedback is positive, that's a good thing. Looking forward to watching the BAM! continue to develop with new tools and features. Nothing comes to mind - most of the elements we'd like to see are in the process of being built. The ease of use is really key for our team. Multiple admins had no trouble with setup and management of the system. Some features we'd like such as direct social share are not yet available but are coming. The team at BAM! are fantastic to work with. 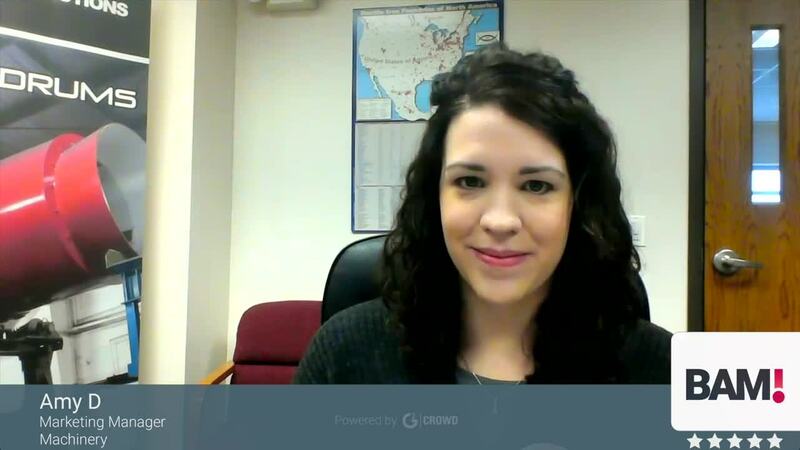 Having our assets/news at the fingertips of our team, no matter where they are. "Very easy to navigate as a user." I have been using the BAM Mobile Sales Tool app on my iPhone as our company rolls out DAM. We've been seeking a uniform, structured file system that can be published and deployed simultaneously across all of our mobile team members. It's great to have something to refer to that always reflects the most current, approved sets of information. I am more often than not defeated by technology, but this has been really painless to use and understand. I wish there was a way to sort things myself as a regular, signed-in user per my own organizational style. If it was possible to do that and still get updated versions of whatever I moved, I would be very pleased. Give it a good try and I'm sure you'll see its potential to keep things consistently organized and accessible. It used to be difficult to know which versions of a file were most current, because we get product updates on a near-weekly basis. When you get a dozen file changes a week, both minor and major, sometimes you forget to change a couple and then you're "behind" and giving outdated info without knowing it. This app keeps everything current for me to use comfortably. "Not Just for Sales- Valuable as a Communication Tool for Accounting to Communicate w/ Entire Company"
BAM! provides a method for not only our marketing and sales teams to distribute information. It also allows the ability for our other departments to distribute information to our 27 branches while also allowing administrators to limit permission in a quick and easy way. When employees leave the company, the permission features provide ease in adding and removing users, keeping confidential company information private and secured. The application overall is great, intuitive and easy to learn. As I was using the application there were a couple of areas where I felt that a slight improvement of user experience and navigation would be nice. The best part was that not only is there an easy process for providing feedback, the suggestions were acknowledged and responded to. Also, it was great to see that the suggestions were actually made to the BAM! platform within just a few weeks. It has been refreshing to work with a team that is responsive and receptive. Don't just think of BAM as a way for marketing to distribute information, it is a great organizational and communication tool for all departments. Timely distribution of pertinent information, template integrity, accessibility of company information to employees. A great communication tool and helps bring standardization to branches. With many branches it is difficult to implement policy changes and provide information in a timely way. BAM! allows companies to upload information easily and send out notifications to users immediately cutting down the implementation process time. 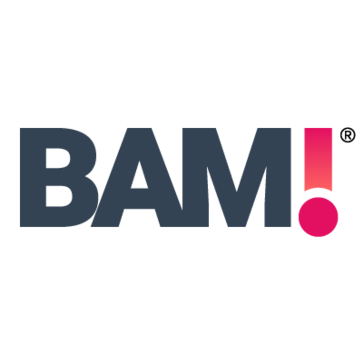 "Amazing Sales Tool for our Clients"
So far my clients are totally delighted with BAM! and the power it gives them to keep all our latest collateral and product advertising materials in sync across their organizations — everyone loves using it! If you're looking to push every kind of content or asset (videos, product information, spreadsheets, price lists, brochures, presentations, press releases etc) in your company's sales & marketing arsenal to your sales fleet in a few clicks, this is a great product to do that! After developing advertising materials, product collateral and other assets for our clients, they really struggle with how to distribute and update all the existing materials in the field and make sure their sales and marketing teams are aligned with the latest strategic and product communication materials we create. BAM! has become the perfect solution for us in addressing this problem as we're able to update, publish and manage all the content created for our clients directly from the BAM! Platform. "Great tool which is easy to use and provides digital management of information." The information that is needed is readily available and easy to locate on BAM! The product is intuitive and takes the guesswork out of trying to find the materials that you need! Honestly, I didn't see anything in my review that I disliked. I highly recommend trying and evaluating the product. You will like the results and the increase in sales. Immediate access for employees to get the information and data that they need to increase product sales! All marketing collateral that employees have access to is at their fingertips. "Helps ease one of our biggest hurdles - static asset organization." We have sales agents that operate across the country and the world. With DAM we can have all of them referencing a mobile application that houses the necessary files for them to execute sales, and then update these files at-will. Nothing at this time, since the features we would ask for are getting added this year. DAM is helping put the most recently updated file into the immediate view of our users. We are at a stage where we frequently change our files versions as content gets restructured, so DAM is very helpful for streamlining file use. "Progress and success in a flash!" BAM! Is the most needed and convenient software I have had the pleasure to use, working in the media and communications industry. It has gone above and beyond to provide excellent service to my colleagues and I. Without it, we would not work as efficiently as we would if we were to use another software. It takes care of our needs and BAM! just like that, we have progress. This software does not have anything that I dislike. We are solving issues of client filing and organization and digital management assesment. The benefits I have realized are the ease of access within the software. I really liked that I was able to manage my financials on the app. I did not like that it required the user to have a smart phone. I am still currently a student; however, we have found that we are able to better manage financials, especially when it comes to small business owners. * We monitor all BAM! reviews to prevent fraudulent reviews and keep review quality high. We do not post reviews by company employees or direct competitors. Validated reviews require the user to submit a screenshot of the product containing their user ID, in order to verify a user is an actual user of the product.